To begin from the 1st post at anytime, click here. Click "Newer Post" at the bottom for the next post or the left arrow at the bottom when viewing on smart phones. Do the opposite to go backwards. 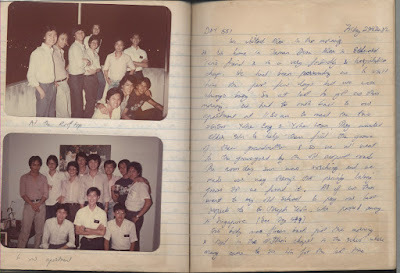 A modern-day letter/journal shared with my LSD friends of Lima Sains Dua 1975 with their spouses, other fellow Johannians of SJI including girls who joined us in Form 6 only. Please take some quiet time to reminisce what I am about to share below. It's from the Feelings of my Heart. It will only take me a short time to share online as I have spent my life being a "Chronicler" that I didn't realize. 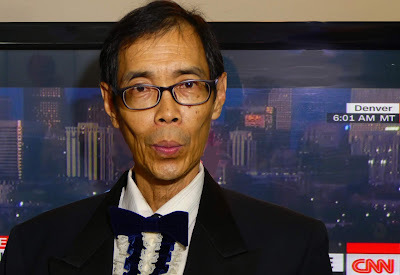 This title was given to me by our intelligent friend and former Microsoft MD in Malaysia, Benedict Lee Ban Hock, not too long ago in our brief online chat. I like to warn that this sharing is not just using multi-media technology of today, but is also a reflection of a post-millennial era of Human Consciousness, especially of mine, that can flip from one moment of time here to there as well as from this location to there in an instant, even the change of a subject! 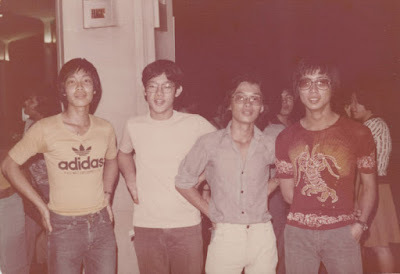 Some who viewed this old pic above taken some time in our 1974-75 school years together, like Chian Howe, Wooi Teck, Chuan Huat and I seen in a more current Dec 2018 pic below, where we were trying to recall where the above photo was taken at. 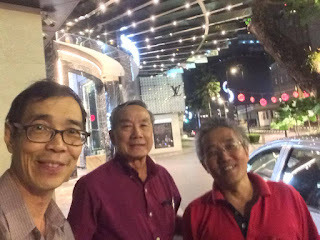 In our small get together a few nights after the 8 Dec 2018 turning 60 big reunion dinner, Chian Howe thinks it's Mimaland, Chuan Huat thinks it's Camerons, I thought it could be Lake Gardens and Wooi Teck wasn't really sure! I guess we all learned as we started to discuss past memories that we really remember only the ones that we had strong feelings or emotions about. This is because they happened many many years ago and since then, many more memories have been added to our memory bank that may make the earlier ones to become more faint to be recalled especially specifics are concerned! 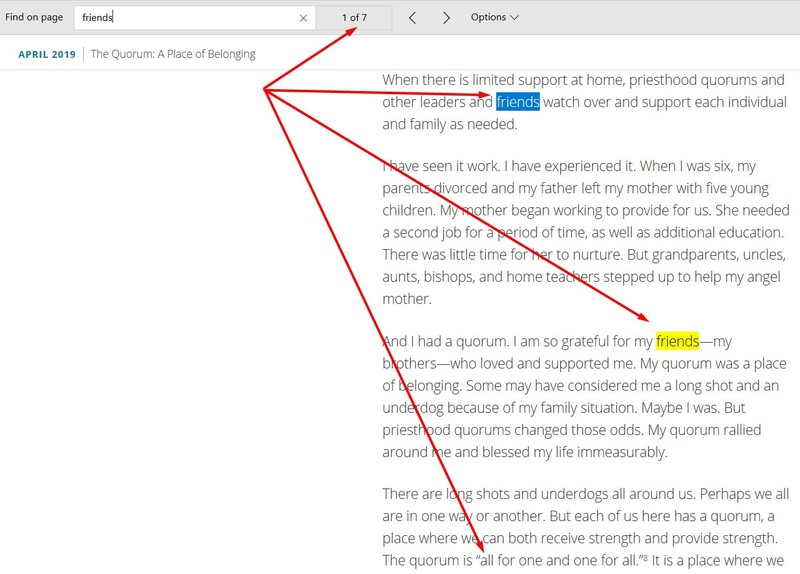 One thing for sure that can be stable in this online journal is about my "Feelings" shared today when we are all qualifying into the senior citizens class! Fortunately, I realized from young that I naturally had poor memory and compensated my weakness with the use of photos, videos, written records and later with computer technology to index all that I wish to remember so that I can recall them specifically and fast too at any time present or in the future. 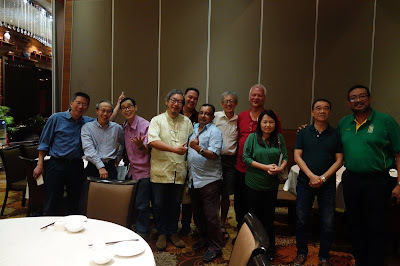 As mentioned above where we couldn't figure out where that photo was taken at, a video created below of our turning sixty reunion event I believe can keep our memories for a longer time as compared to a photograph when shared in a future time. 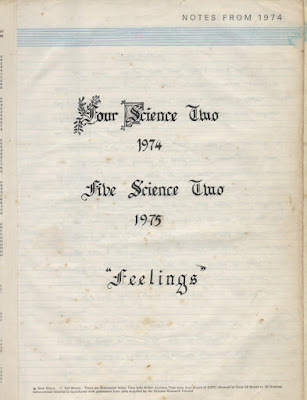 If our memory gets too short to know where is the above place in this long post I mentioned or one had skipped it while quickly scan-reading down to this point of the journal to read, just click here to auto-scroll up! The two links I've provided thus far was the first that leads you to another page to explain the meaning of the word used. The second to 'click here' was to lead you to another part on the same page you're on here. 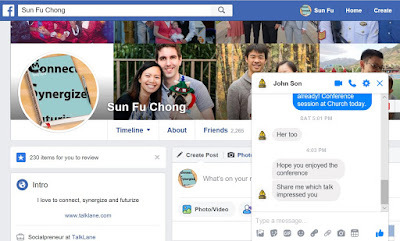 This is a sample of the online technology today, using HTML language, of the flexibility one has to direct a reader/user to share more information. 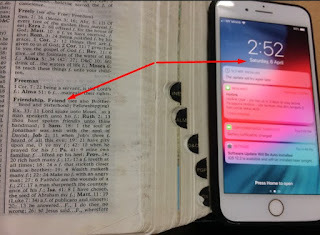 If one is not familiar with how to maneuver around a smaller sized smartphone screen which is harder compared to a larger computer screen, just avoid clicking any links at all as it's not necessary to follow the optional redirection or flow provided. Just scroll up and down like one is reading a book by turning the page forward or backward. 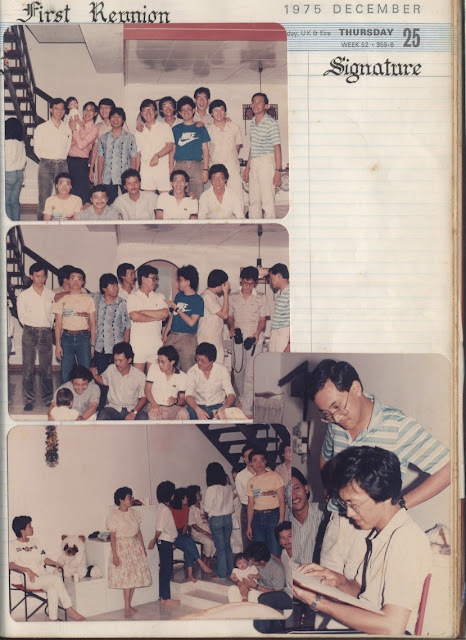 The last photo above from my memory was after our Form 5 major exam and we all wanted to celebrate and had a party at Kim Hock's residence at Jalan Yap Kuan Seng which is very near the KLCC today! 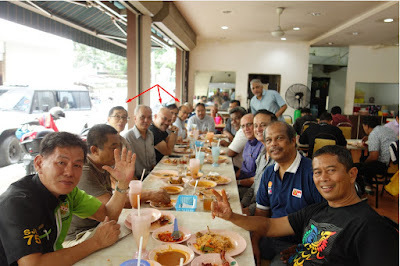 Now the reason the red arrow points to Zubir is just a few nights ago, we had a long chat on the phone. 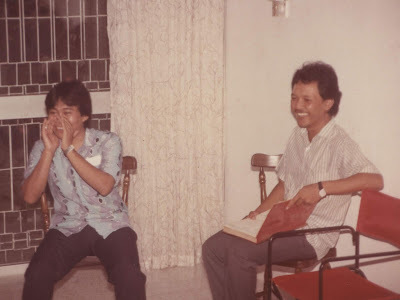 He was the Malay boy from our special class of Science two whom I had deeper roots with as with as he grew up with me in the same Kampong of Ampang Jaya together with another Johannian named Alvin Lim Kim Chuan whom I classify as one of the many affiliates of our Legendary LSD class. 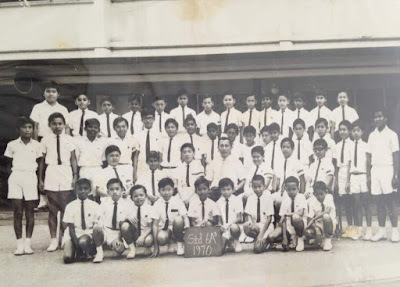 Click here to jump below to the section where I will write what Zubir shared with me that helped me reawaken my Consciousness of how special our Class of 4 and 5 Science 2 was that planted something in us that made a big difference for our future. It became a rationale we possessed where each could create our own narrative that would strongly influence the decisions of our life's future after leaving school. I said we were 'Legendary' as this plaque we donated to the school meant to encourage others after us to follow the same Spirit of the Eagle that made us Legendary! 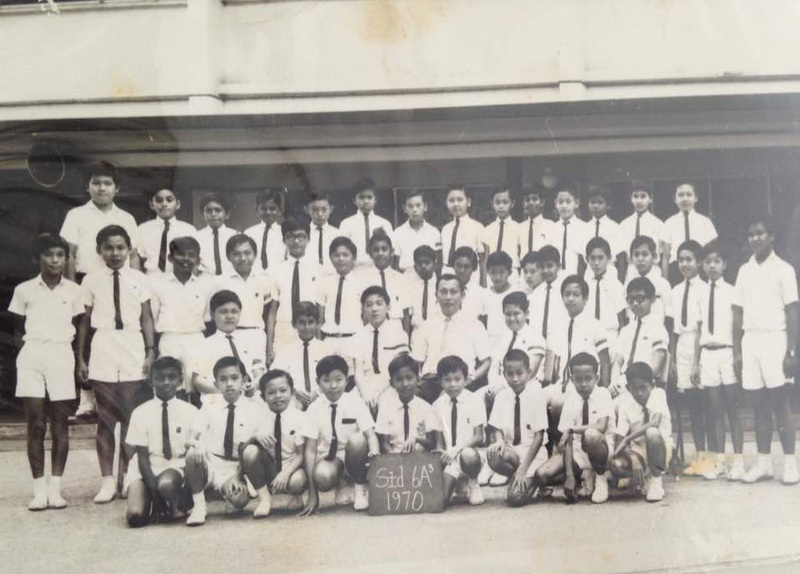 Now after Form 5 in 1975, we began to go in different directions as some did not continue to Form 6. Now some started to journey overseas like this photo in London UK of 1976 Nov/Dec. 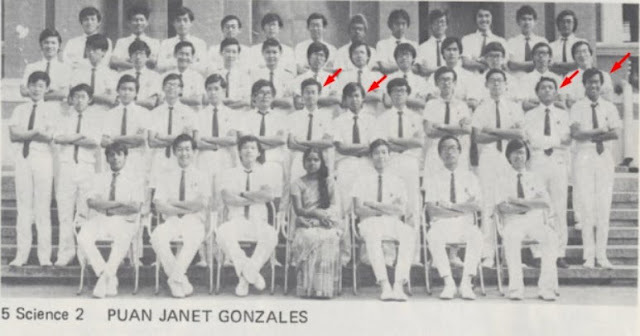 After one year at Taylor's matriculation program, it was my turn to go overseas for my education in Feb 1977. Grateful to have this pic to remind me of my LSD and affiliate friends who took the trouble to see me off! 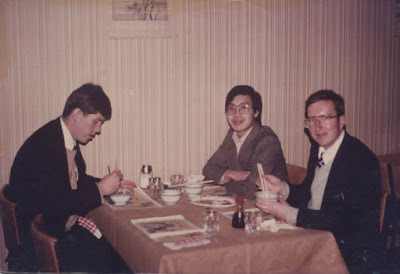 I guess the magnet of the LSD 'Feelings' caused me to find Victor Liow whose family had migrated to Melbourne Australia. 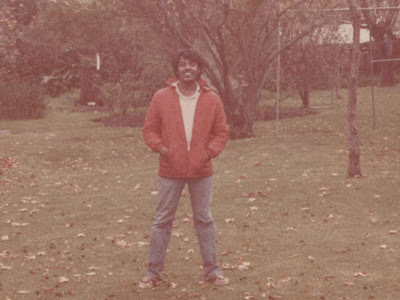 This strong magnetic force also worked on Govind who like all the years to this day, he will suddenly show up like he did in the photo above after hitchhiking all the way from Perth to find me in Geelong Australia before finding his way hitchhiking to Europe and then finally to the US to continue his education! 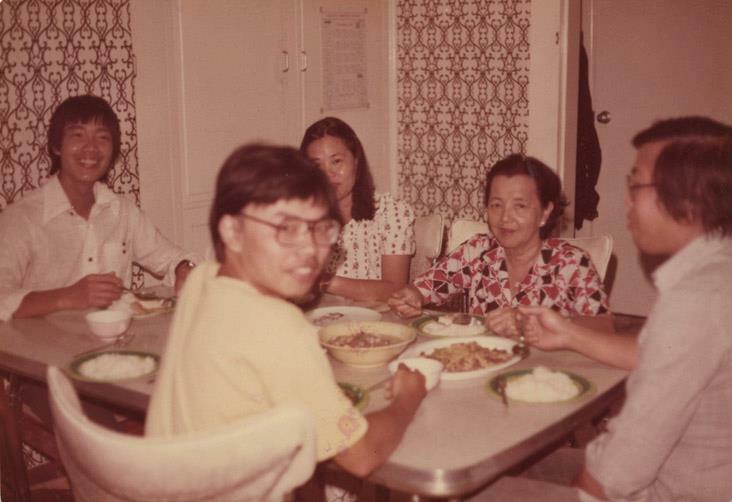 This photo shows my Mom and Sister-in-Law visiting me early 1978 to check on me haha! 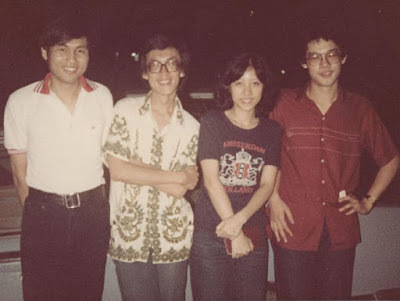 I share this photo to highlight Lim Tong Leong who is the older brother of Alvin Lim Kim Chuan, from my same kampung who was the very reason why I chose to study in an unknown University in Geelong when my matriculation results qualified me to go to Melbourne Uni or RMIT college. 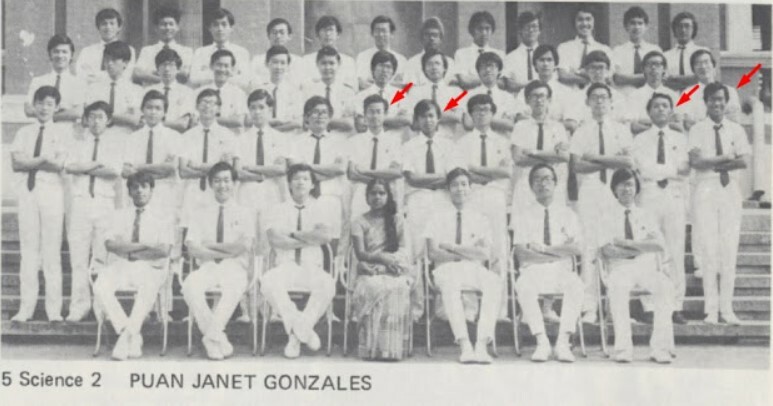 I felt that he was a Johannian affiliate to LSD too due to his younger brother who is also an LSD affiliate who became my buddy for life! It was the best decision I made as from my buddy's brother, I learned how to be really independent by picking his Architect's brain and follow all the crazy outdoor lifestyle he exposed me to in Australia. Something happened to me in Australia where from LSD mindset, just before I turned 21 in the year 1979, my life was augmented with the LDS culture, same 3 letters slightly changed in its order! LDS was the short form for the full name of The Church of Jesus Christ of Latter-day Saints. 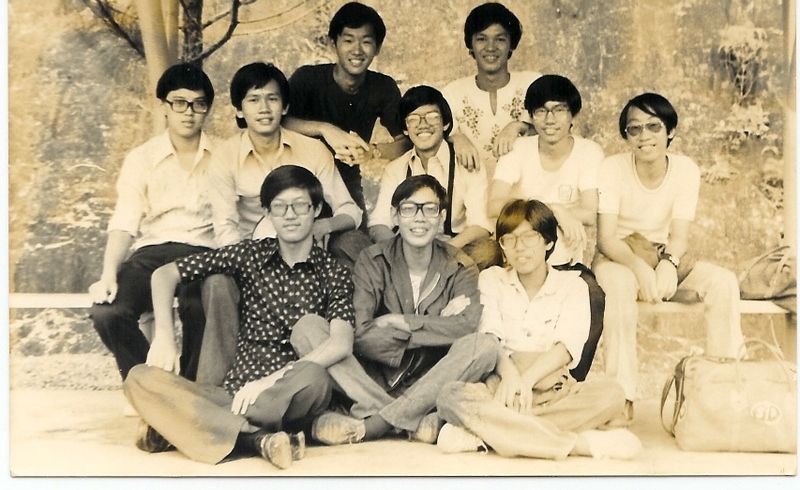 After I graduated from the university in 1980, I came home to serve a voluntary mission for the Church. My old friends of Sc2 made an effort to come and visit me in Kuala Lumpur where I was based for some time. When we all finished our education, the marriage course or of course was the path to follow and here is a photo of Ben and me in our dating years in 1982 on a trip to Fraser's Hill together with our future wives! 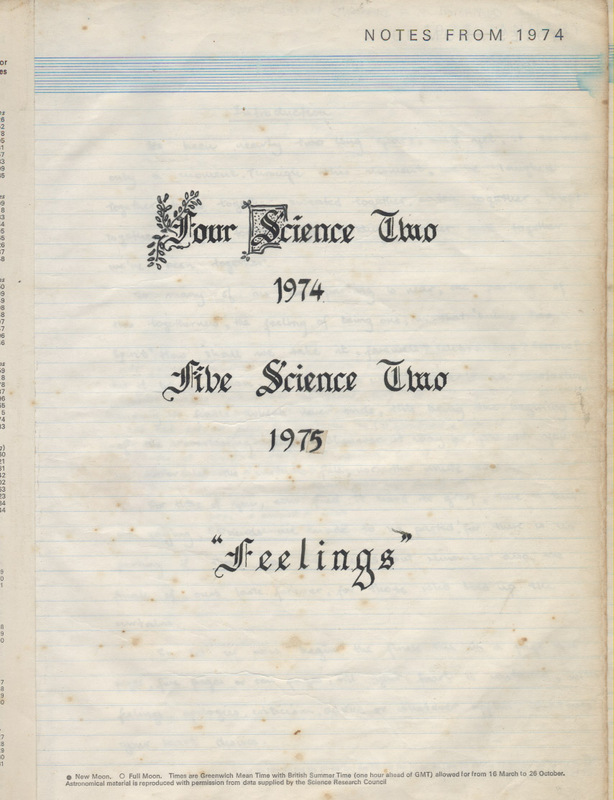 However, the strong bonds of "Feelings" kept us two couples close to each other together with many of our other classmates for many more years to come. At Benedict's first home in 1986, after being the first to be married, that we are aware of as those days there was no cell phone or internet to easily know for instance if Baldev Singh got married earlier or not than Ben and Joon. 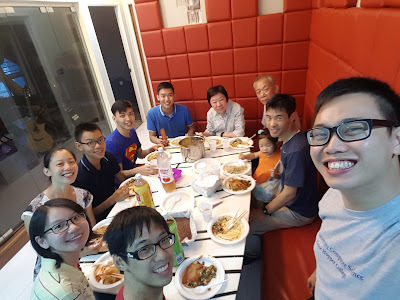 We were glad to have an informal reunion to also help him move some furniture too as helpful friends. 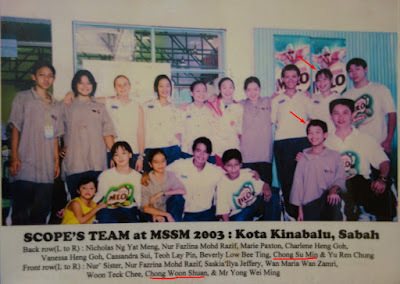 Ahmad Zubir was the only one of our four Malay boys in our 5Sc2 class that I could keep in contact over the years as our roots were deeper together as I use the term, we came from the same 'Kampong' or village in Ampang Jaya. From the photo above he is 2nd from the left pointed out with the red arrows on my Malay classmates in 1975. 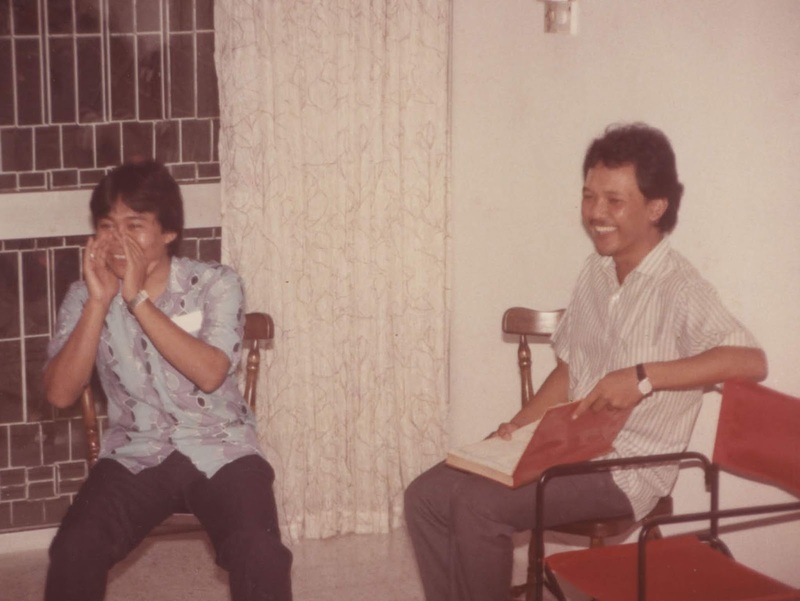 On his right is Malek Reedzuan. Further on Zubir's left is first Darius Abdullah who is followed by Shaidan bin Sulaiman. I would visit his home by bicycle and vice-versa. 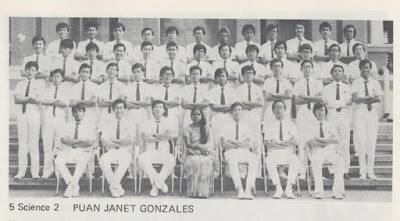 However, once we left SJI school, as time went on, we each would get busier continuing our life's journey with further education, career, and marriage. It got harder to stay connected with each other especially when technology like Social Media, did not exist in our early days. 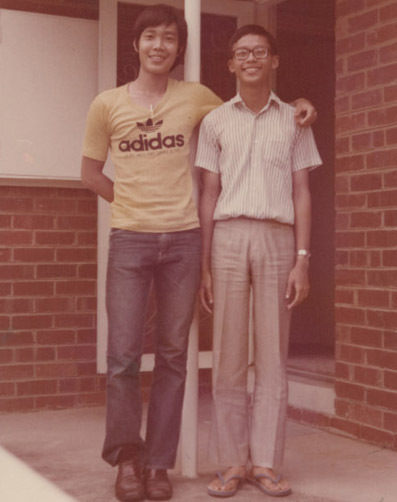 A Malay boy student friend that I could continue to stay connected with was Ainuddin Hamid, who was not from our 5Sc2 class but was also from our same 'Kampong'. He also eventually lived not far from our Kampong off Jln Ampang as I did. 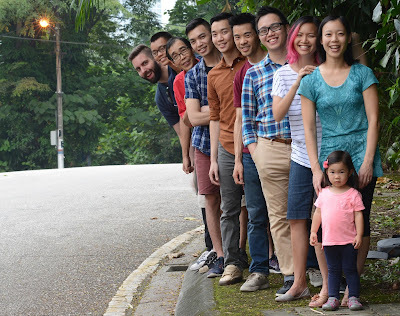 So after we finished our education and came home to Kuala Lumpur to start our careers and own family, we could continue to stay in contact. 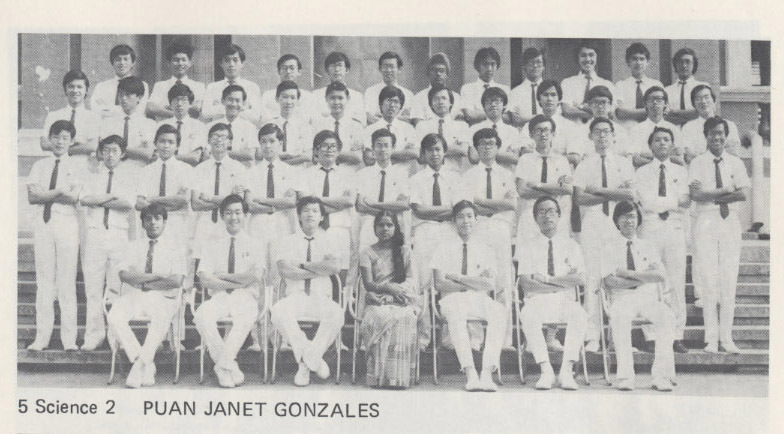 But where were my other Malay friends from LSD? 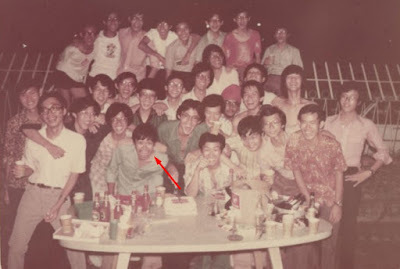 I started going through my old albums and journals to find out that Ahmad Zubir and Darius Abdullah were last seen in our LSD class reunion in 1986, confirmed by checking our Class Red Book that had a page with multiple photos of that day shared above. This meet up occurred in the year 2016 and was shared live on Facebook as it happened! 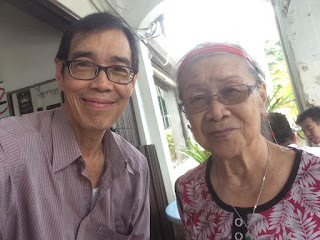 As I started to follow up with my Johannian friends on the phone for our "Roaring 60s" reunion event, I had a very interesting long conversation with Zubir on the phone, my friend from the same Kampong! We started talking about our LSD class, recalling all the wonderful memories especially amazing things we achieved like the Thailand trip especially! Then he said something that hit me in My Consciousness...that there was something special in the combination of different characters in the class that somehow made us acquire a special/magical attribute that was 40 years ahead of our time! Those words he said that was well articulated or words that caused an effect on me like a lightning bolt. I guess this was due to a book I've been writing and preparing to publish as soon as possible, from an unknown aspiring author from Boleh Land, that has been on my mind all the while! My book is covering the most important topic of Human Consciousness where Scientists and Religionists are giving all sorts of differing opinions and views! 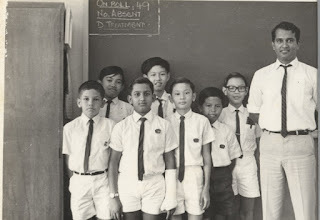 I was in std 6A3 on the far right back and Nazli Shah is on the far left back. I went to a lunch to celebrate Nazli Shah's birthday (middle arrow) at Bilal Restoran Jln Ampang where Kamarul Bahrein (right arrow) at the lunch was also from 6A3 but not in the B&W photo above. But guess who was sitting beside me? Darius Abdullah and Ikbal in the centre who brought him to the lunch celebration! Now you can compare the old pics of Darius as well as Zubir with the colored photo of two of them above that is in color and the B&W photo of the class pointed out by the arrows with names in the caption below. I told Darius at lunch, sitting beside me, that I had been thinking about him for a long long time over the past years as we were sitting quite close together in class at school during Forms 4 and 5 years. I've never met him in all the different gatherings or reunions of our schoolboys over the years so was wondering where he had gone to. Lo and behold, he suddenly just showed up. He and Ikbal decided to stay longer after lunch to sit down with me to catch up with one another. 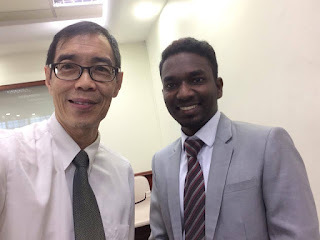 I learned that he and Ikbal were part of a special program by the government in the 70s to place students like them who lived in villages outside KL to integrate with students who lived in the city. 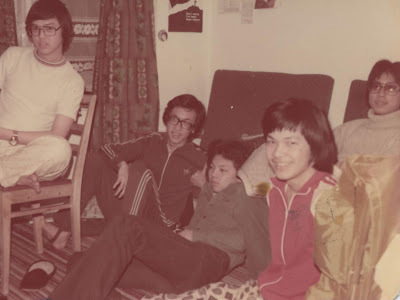 They lived in student dorms or 'asramas' in Malay where green army trucks would ferry the students to school and back each day. I remember seeing those army trucks parked near the school in my student days thinking there were parents who were in the military who sent their sons to St John's. After so many years later, I now know why were the trucks there and appreciate how the government was helping to improve the standard of education in the country for those who were living in the outskirts. I asked Darius if he knew where were the other two Malay boys and he said he did contact Shaidan once before and that he was a doctor in Ipoh. Later through our WhatsApp connection, he gave me the link he found through Google here. I followed up and soon got to talk to Dr. Shaidan who is an anesthetist today. Dr Shaidan came late as he had to travel from Ipoh where he works and live today. 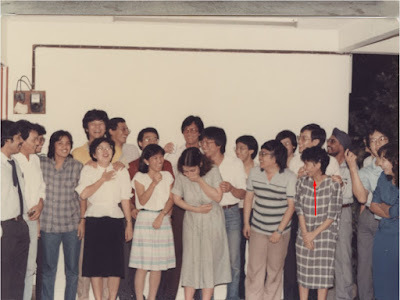 Compare this look from a photo I captured of him at the party to the old B&W class photo above where he is on the far right pointed by the red arrow, we can see that one can tell it is him. So there was only Malek Reedzuan left who was unaccounted for. 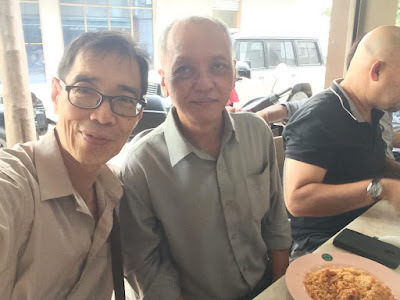 Now at this point in writing, I cannot recall how I could find the contact number of Dr. Malek Reedzuan who runs clinics with his wife in Johore Bahru as well as restaurants and a Karaoke centre!!! 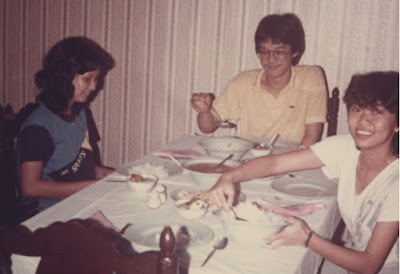 I just know that as I'm doing my best to contact long lost friends when it came to finding the 3 Malay boys not from my kampong, Darius, Shaidan and Malek, the moment I saw Darius in the lunch celebration, I knew there was some 'Synchronicity' going on or 'Serendipity' of my life occurring again as recorded in past journals starting from here. 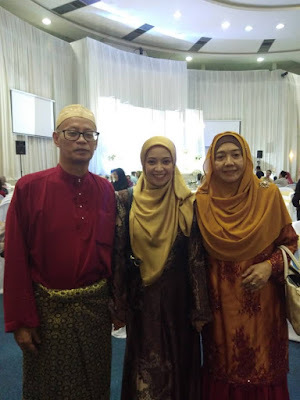 I got to connect to Dr. Malek Reezuan on WhatsApp to receive the above photo of him on the left with his first wife, Dr. Nafisa on the right, also a doctor and his daughter Saleha an accountant. He is married to two other wives. From his first wife alone, he has 5 children and 7 grandchildren. The 8th grandchild will be born in June 2019 he informed me! We soon started to call each other on the phone to catch up with each other. Through our many conversations on the phone, I discovered he was a different Malek I knew at school who was very quiet in class and spoke only very softly. On the phone, he was very lively almost as I am and we could call each other at any time to feel like speaking to each other! I also discovered that his birthday was on Dec 8 itself so I informed him that he will be our Special Mystery Guest for the evening not just because of his coincidental birthday but that he had actually worked in the mental illness department of many of the local hospitals in the country and that he feels he has discovered how to open one's mind to be happy every day! The government would allow them to protest and I personally thought it was a fair thing to do in Malaysia with a democratic parliamentary system in place and that I myself had joined street protests in the past too! These were against corruption in the government, protesting under the BERSIH yellow flag that eventually resulted in the loss of the UMNO party or the national coalition front of Barisan National in the GE 14. This time around, the majority of the votes of the citizens allowed the opposition coalition under party Harapan to win who then formed the new government we have today. A couple of days before Dec 8, Mothership news in closeby Singapore was giving reports their Ministry of Foreign Affairs MFA was warning Singaporeans about the street protests to advice their citizens against travel to Kuala Lumpur. This same news was reported in their Straits Times news too. 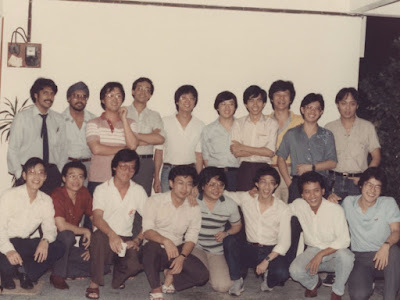 This caused some of our old boys now who have moved to live and work in Singapore to be concerned. 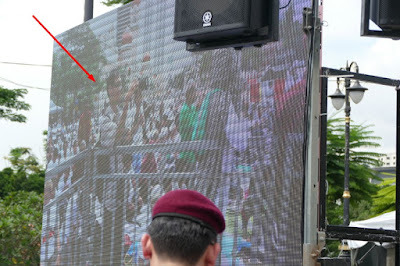 The lady with the white hat is from Channel News Asia who flew in from Singapore. There was also our local Astro AWANI reporter, Arfa Yunus doing a live coverage. It was a celebration by the ICERD protestors which all turned out very peacefully, Malaysian style! This allowed the SJI event of the Roaring 60s on Dec 8 to carry on peacefully too with more fun of course! Su, Jay and Leah arrived safely in KLIA but on transit to Taiwan first! It's a long way to fly from Boston so Leah is catching up with her sleep! 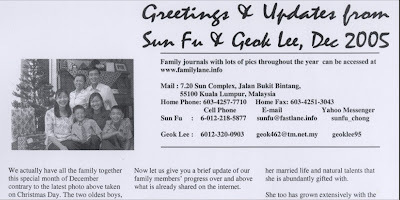 Meanwhile, notice is posted to friends and family though social media about the BIG reunion that will take place soon in Kuala Lumpur by "Dad the KL City Kid" It is also a great motivational part of this Dad to proceed with the digital pre-launch of this Malaysian social media character's First Book. 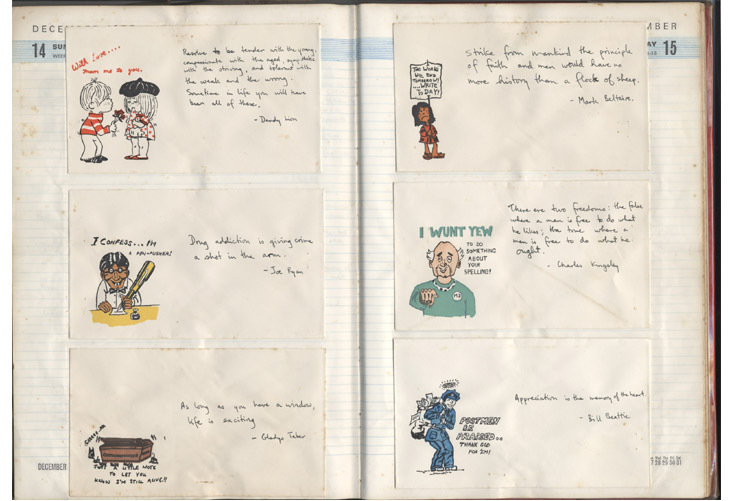 So far he has only been creating online journals augmented with photos and videos. 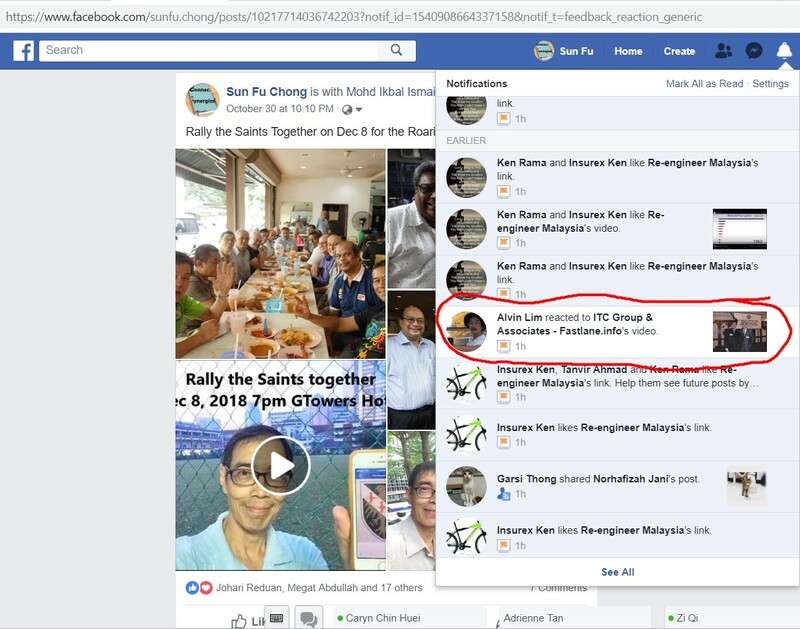 Han is mentioned in my "Latest News" social media post which I use to express myself or my Consciousness as an aspiring Writer and Socialpreneur helping to Re-Engineer Malaysia today. 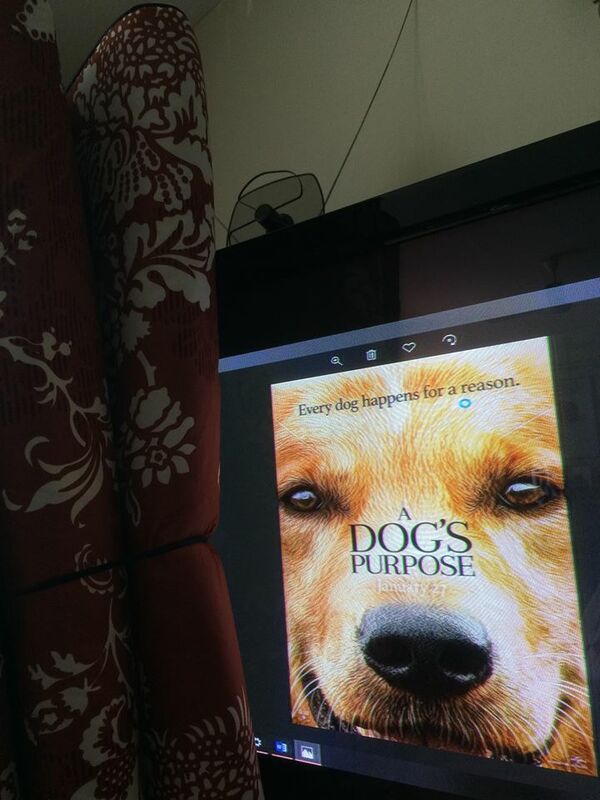 Father Dog has planned Malaysian styled tatami mats for all his Doggie-Lioness born children to watch this movie together knowing they're all not going to sleep much with all the excitement expected in his apartment. With fast internet access, large screen displays and amplified sound systems found in an airconditioned living room and bedrooms plus a wet kitchen that the 'Good maid' can cook anything. He even helped to save this apartment from going to the wild and corrupt dogs as shared here due to his latest choice of a career to be a writer and socialpreneur. He hopes to be an example to his children to adopt the principle of always Thinking and be a Life Long Learner shared in this soothing video. 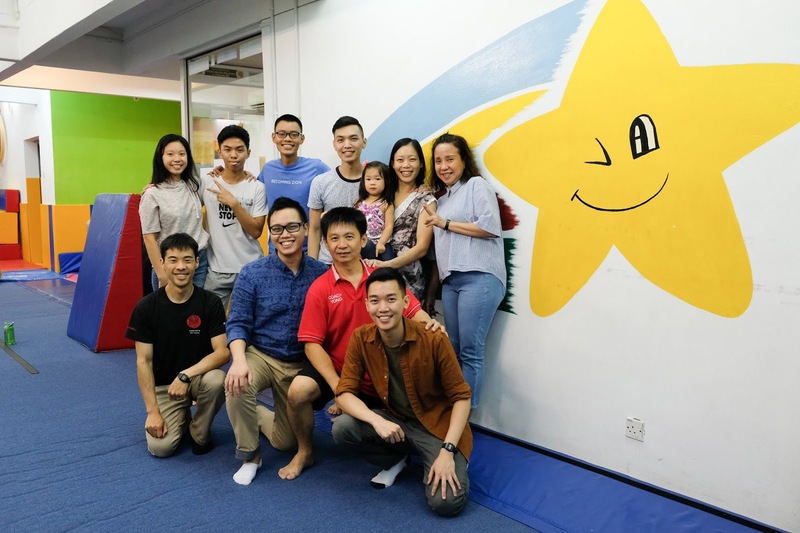 With 6 children growing up at different times, some attended kindergartens like this one. 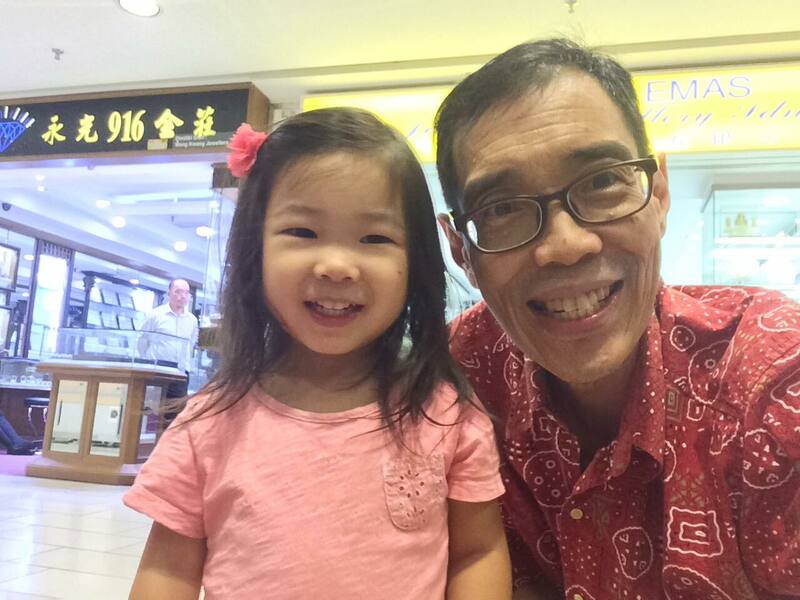 ...so I asked the shop owner if she remembered the children in Cantonese dialect which she replied yes especially Me! Ha Ha these lady businesswomen are very sharp! Then we got into a conversation about how time flies and talked about how we have aged where she replied quickly to point to my still very dark hair!!! Further down the road, the 'kids' wanted to see if the same fruit stall we patronized was still there. We found a younger man running the place and I asked him was he the son whose parents manned the stalls in years passed. He acknowledged and when I asked if his parents still man the stall and he replied in the affirmative to comment that they were having a holiday in Taiwan! From fresh fruits to barbequed pork, the streets of Ampang had all that the children remembered and loved! With 6 children, we have tried a variety of schools near Ampang including those in KL. 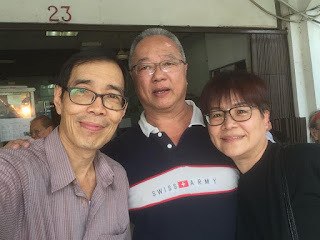 Shuan, for example, started kindergarten in 'On Pang' which had a primary school too but he went to Kuan Cheng primary, then transferred to Chung Hwa primary off Jln Ampang near the Thai embassy and did his secondary in Tsun Jin of Loke Yew road. 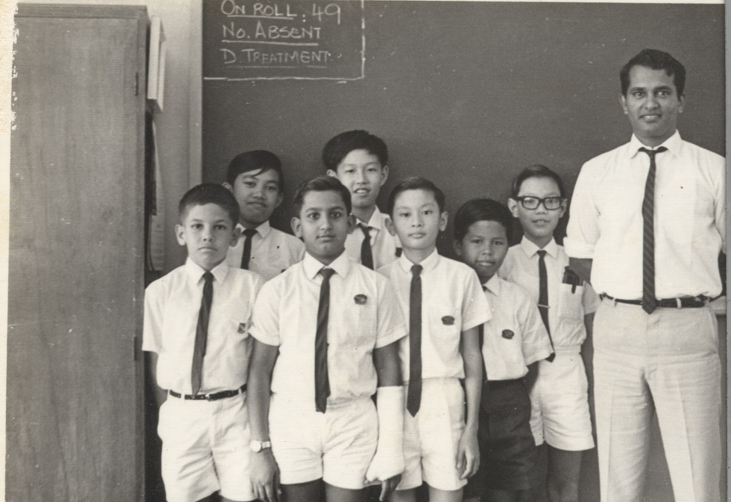 He later moved with the family to Singapore to repeat secondary two at ACS Anglo Chinese School. Other brothers Han, Ern and Ray all were blessed to have good education in ACS. So the walking tour of Ampang ended here at the old kindergarten of Shuan that was part of a primary/elementary school. The facade of the building of the school in the background had changed to look like a 'Fantasy Land' design from Disneyland seen in the far background partially hidden by the tall gates of the entrance of the school. Missing in the photo is the 'Big Boss' or the oldest brother Han who could leave after work only on this day. 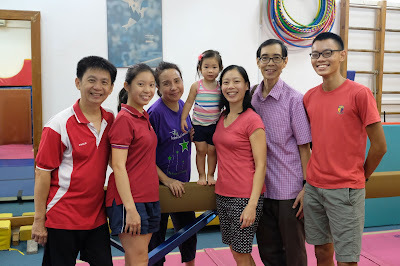 The gymnasts of the family who didn't get to see the Yongs followed up the next day to visit the gym named Scope. Finally, all the gymnasts of our family got to visit Scope again to meet with the Yongs! 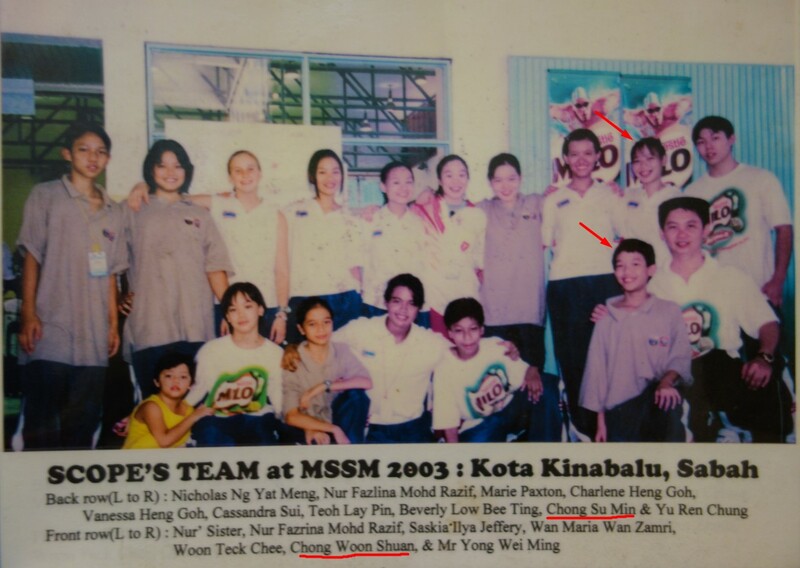 In their gym are many old pics of past events and this one of 2003 brings back memory when Su and Shuan qualified for the Malaysian finals held in East Malaysia. The Yong's came with their children to our home for a social get together and enjoy competing on computer games which amused the dog looking at their faces of reactions while they were playing! 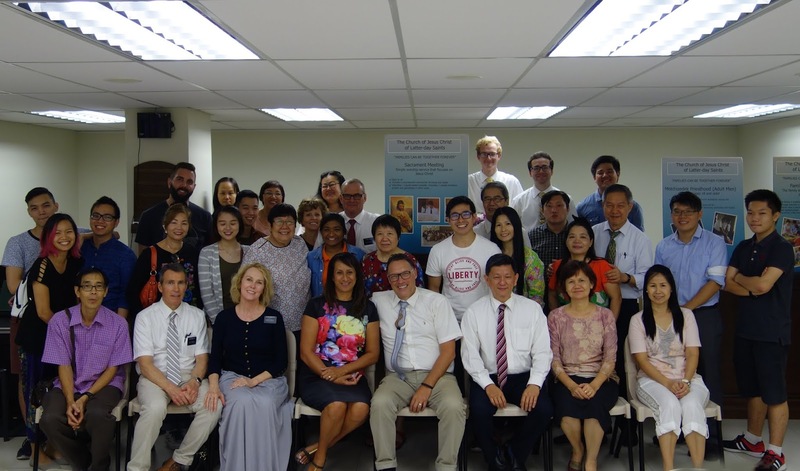 At the "Munch and Mingle" session after the open house of Cheras Church branch, visiting with several older member friends who were originally from the KL branch in the early 80s when we started our family. At the end of the short video above, I initiated our familiar family cheer. From my research on Human Consciousness, I found a video below by a well known social psychologist that explains the reason why this family cheer was relevant. The energy level is high when Familylane members get together with the youngest Leah in the middle of it all recording memories to be remembered as she gets older just like what her uncles and aunty have carried forth with them! I know his wife too and met several of his children at various times either in the US or in KL when they visited who would enjoy climbing hills with me as recorded in this 'Peaks of my life' journal. 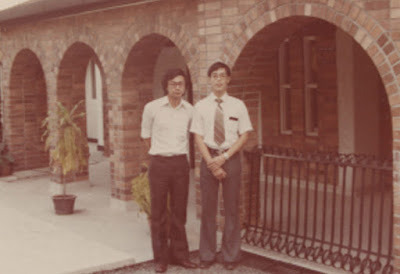 We have similar backgrounds that we both joined the Church in Australia in our student days where he was much earlier of course as my senior. 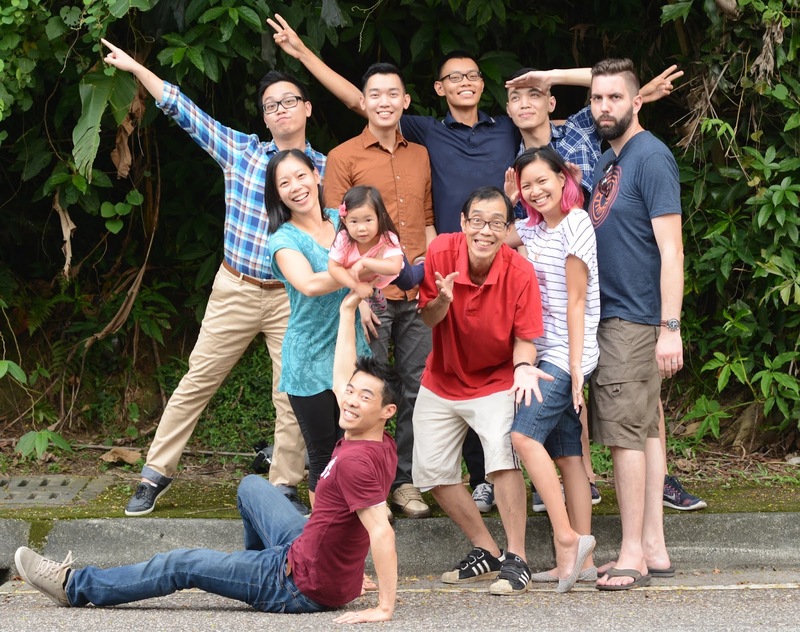 We both became CPAs in our initial career path that turned to become entrepreneurs later. We raised 6 children too where he has four girls while I have two. Our network is strong both in the family as well as our friends and associates worldwide. "Family and Friends are Forever" has been my belief ever since young and while I have seen enmity or feuds in family and friend relationships everywhere, I'm glad my own circle of family and friends have been my joy or treasures till today where I will try to connect with them wherever they are in the world. 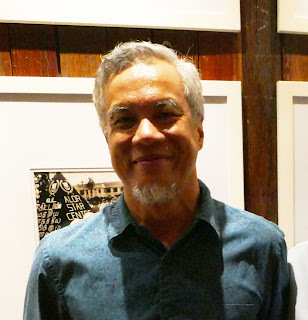 "Dad the KL City Kid" turned 60 but still a kid in his Heart but with a Mind and Spirit like fine wine that has aged with collective wisdom from the earth and beyond! The latter is a reality to me not just because of the teachings of my faith alone but I actually have chronicled true experiences that have occurred multiple times in my life like this one where the inspiration to write a book was located. I used the metaphor of the Story of 7 to hide the implication of miracles in my life that keeps happening which I try to keep up with in my Spiritlane journal which is somewhat more sacred I felt. The boys in Singapore had to go back first as work starts on Monday. This was a much shorter journey to travel home as compared to the reunion in 2016. 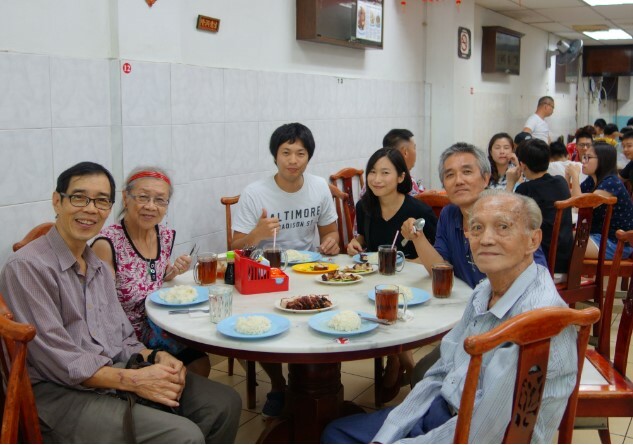 The family get-togethers continued in Singapore. We see Justin and Ying Er on the bottom left of the photo above. 7 years ago they are seen in this video to be playing the violin together, with Han on the right of the photo playing the piano, who composed the music, and Superman Ern playing the flute. The two violinists fell in love to be married in June 2016 thus making the above gathering as a reunion of the Thongs, Chongs and Lius. (TCL) Hmm... reminds me of my ITC group of companies I started soon after marrying my wife, being an Initiative of Thong and Chong! 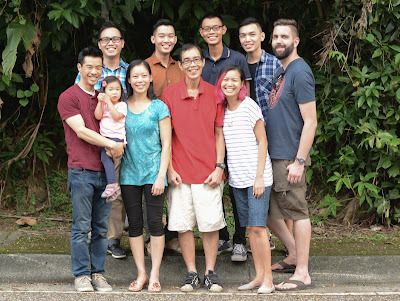 The girls from the US with their spouses could stay longer in Asia to use the time to travel a bit to neighboring sites where only my granddaughter and parents could spend another 2 days in KL at the start of the 3rd week after returning from their visits to nearby resorts to catch their flight home from KLIA. Leah is such a Cutie! She was so excited to go through the routines like the other much bigger kids! She is very responsive to her Grandpa! Just look at how she smiles at the camera or two cameras haha! She was sleeping when she first arrived in the airport, as seen above, and is also sleeping at the start of her long journey home to Boston from KLIA! Wow it took me till the end of the month to recover from the big reunion we had in Kuala Lumpur but this Monday morning, I'm in fast forward gear again! This post of Nov 1 is here because of my perception. While finishing some important notices in WhatsApp for a bigger reunion event next month to celebrate all our old-school boys turning 60, Facebook gave me a notification that my buddy Alvin Lim in Melbourne liked the above old post for some reason. The video shares an exceptional latest scientific knowledge about our human cell that it is the foundation of how perception is possible in us which makes it possible for us to change our behavior and even our state of health to challenge the old belief that it is our DNA that determines our health! I was so excited to sit beside my old classmate Darius Abdullah who sat close to me in our classroom in the year 1975 to tell him, "Darius, I want you to know for many years I thought about you wondering where have you been all these years and suddenly you show up!" 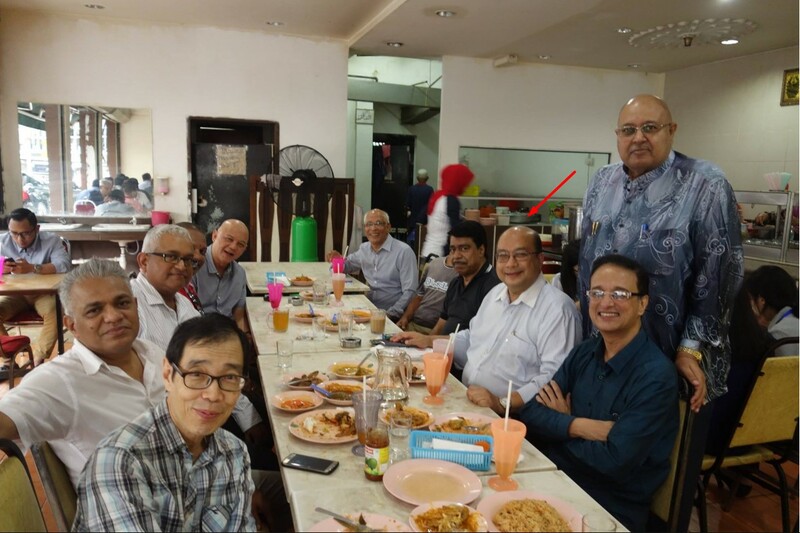 I was glad that I made an effort to attend the lunch celebration of this group of old boys to celebrate Nazli Shah's birthday as my perception and familiarity of this group of boys had increased. I learned that Nazli was in an old photo of 6A3 class that I had always treasured as it is the only photo I have from that class. Nazli is the one on the far left and I am wearing my signature glasses on the right. He informed me in the lunch gathering that there were three of us from 6A3 class who were present. The three were me, him Nazli Shah and the third person Kamarul Bahrein seen at the far end of the table. 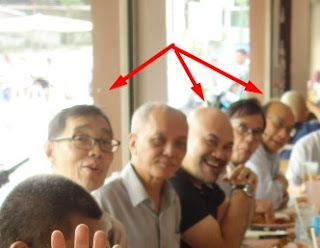 We can see a better photo of Kamarul in this photo taken in the same Bilal restaurant at the start of the year in January where Nazli was not present. 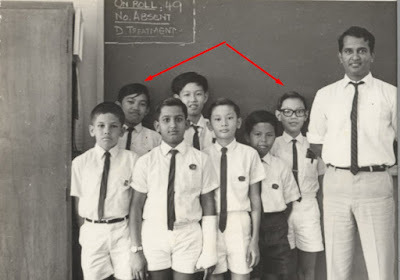 As we talked about the class of 6A3 during lunch, Pardip showed me a pic of a twin class of 6A3 that was in School 1 of St John's primary with a different school teacher while the three of us mentioned earlier was under Mr. Kumaran in the 6A3 of school 2. After the lunch, I took some random close up photos of those who gathered outside of the restaurant that can be found in the proper journal post of memories and reunions of St John's here. 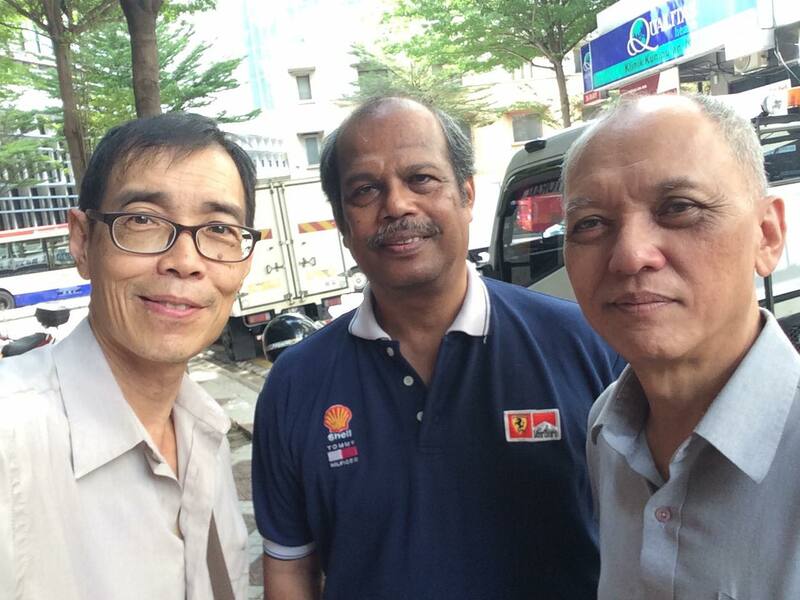 The wefie photo I took of Darius and Ikbal with me above was taken after the three of us spent more time together catching up with each other. It was interesting to get to know Ikbal who was close to Darius to learn that they were part of a government program in the early days to bring students from the rural areas outside KL to study in city schools. Ikbal had maintained good contact information with the group of students who organized this lunch whom I was less familiar with as I had only spent time with them when I was in classes with them in my earlier years in St John's when I was new in the school shared in this full post of my schooling years. 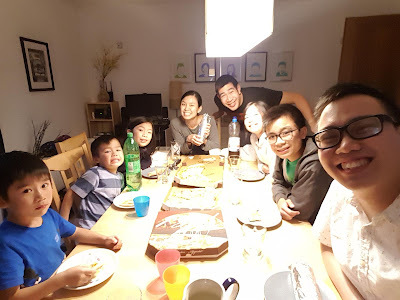 This November 1st post has been a diversion from our Familylane theme probably due to the fact that my friends from school were important in my life due to the relationships we had established together since our youth. It is the very reason why I have often quoted my belief that "Family and Friends are Forever" in accordance with my Perception. As I have always believed, we are all connected in some way or another. 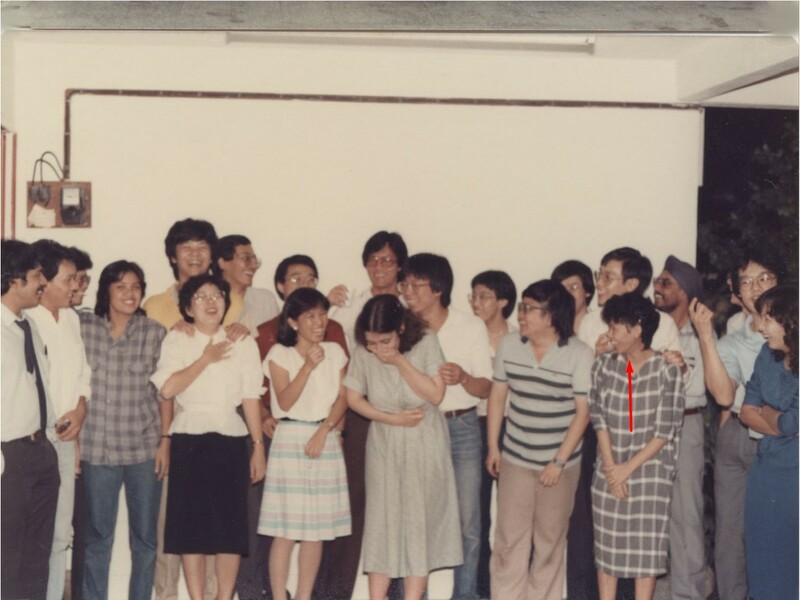 This 1982 photo shows my wife, the Mom of our family, already involved in our school class reunion activities. This was the year when we got married, with some others possibly who had already married earlier than us. 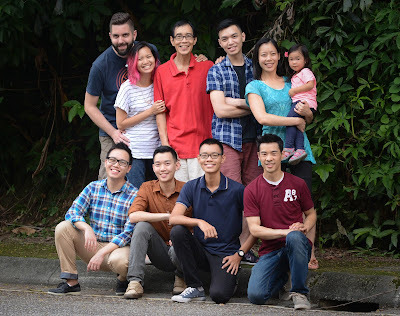 For the family of boys from my Alma Mater, I've created a special post with my perception of our reunion event shared here. After the family reunion in Kuala Lumpur last month, everyone returned to their respective homes and got together again online this time to sing Happy Birthday to Ray who is the youngest who turned 21 while he is still with the army in Singapore under National Service. 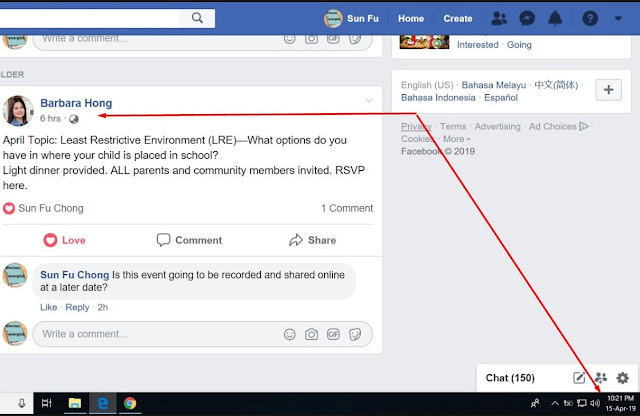 I was watching the video long after our family reunion was over, as part of my continued research on social psychology for my book about human consciousness. I was surprised that the speaker repeated our family cheer double the number of times our family did, hahaha! Mom would be 57 years old today from her date of birth of 4 Apr 1962! This video was created to hear the family cheer again the 7th time after Jonathan Haidt's video above! Published on 7 April in Youtube! It's Monday night and late. I've been a busy bee every day of my life... really! Non-stop learning, doing and reflecting (PAR). It's moments like this in my life that requires me to update my journal, lest I forget, to count my many blessings in life, whether of temporal nature or spiritual. I have to make this short as deadlines of publishing my book, where "Everything Comes Together", will be exemplified. If one would scroll above to the post of date 27 Feb 2019, referencing to our family cheer, I noted that I counted the number of times the cheer was repeated by the social psychologist Jonathan Haidt was 6 times, one short to make it my lucky number of 7. Well as one who forgets dates often when I'm engrossed in doing something, I thought myself lucky to remember my wife's birthday on the day itself of 4 April so I created a video, sharing her artistic talents to commemorate her 57th birthday and counted that as the 7th time to catch our family cheer again. Call it forced luck but it was her 57th which can be considered lucky I felt! 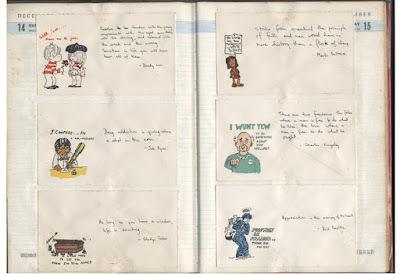 It was rather coincidental too to be able to gather her photos of her previous school work kept in a different drawer from the other family photos I have kept over the years. A few weeks earlier I had sorted and selected some photos for batch scanning and had not done it yet. This made it convenient to quickly create a video to post on her Facebook timeline on the day of her birthday itself! Now April 4th was a Thursday before our Church general conference of April 6-7 weekend in Salt Lake City. The conference would be telecast on the internet. Now due to my 'good luck' in the past to be able to even tune in spiritually to predict what would be a topic covered by a general authority, I felt something special might happen this time but I didn't announce it on Facebook again as doing all these little things will only consume more of my precious time to record more in this journal when I'm focused working on my book to finish it as soon as possible! So I'm doing this today with just the following photos with more links to click, as given above, if you really want to understand how to link the dots of my Consciousness, to understand the meaning of what I have experienced and am sharing recently. The time stamp for this photo is 2.52am on Saturday 6 April 2019 in Malaysia which is before the conference starts as US is a day behind us. It is a page from my old quadruple scripture's topical index about friend or friendship which can be viewed online too. 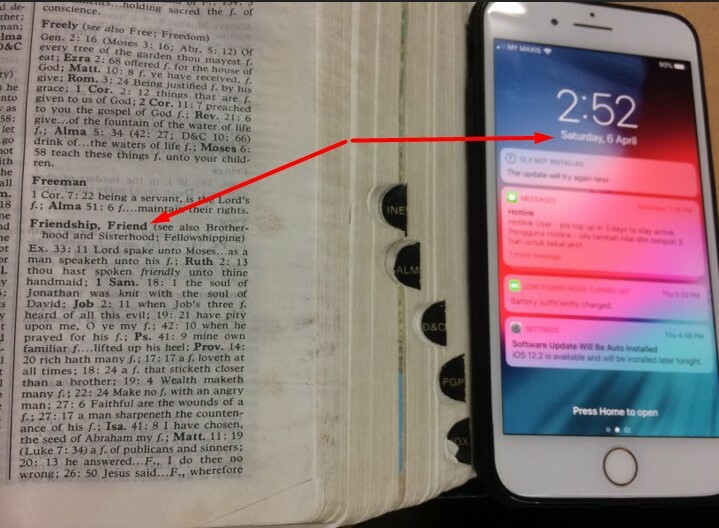 When I was inspired to find it, I was wondering how would this be a topic that would be shared in our General Conference? I just felt that I knew Friends, and Family were always a large part of my life from young and while writing my book, I was also impressed that the Consciousness I had gained from so many friends across the globe I had acquired and be in contact with online and offline over my lifetime was crucial to give me ideas of topics to be included in my book! But look how "Everything Comes Together" for me in the above General Conference video that I viewed on our Malaysian time of Sunday of April 7. One can click here to watch or read the talk by Elder Carl B. Cook of the Presidency of the Seventy to know why his talk became the miracle talk that was related to my topical index reference to Friends, besides providing me the 7th time of repeating our family cheer of "all for one and one for all", both being mentioned above. I screen captured part of the web page of the talk to note friends was quoted 7 times in Elder Cook's talk. Just do a 'Ctrl F' that searches any word typed in found on the screen of the talk on a computer like I did with "friends" to get the same result I got of finding 7 words in his talk and the longest arrow pointing to the "all for one and one for all" cheer of our family rightly counted as the 7th cheer after the video talk of the social psychologist Jonathan Haidt found above. Now on the previous Sunday at Church, I was surprised to see Fidelia and daughter from Kuantan at Church in KL to learn that a group of them had joined our KL branch group to go to the Hong Kong temple recently and had just returned to KL. I captured the above photo to send it to Duncan Horne, whose wife is Fidelia, to pass it to her. Soon Duncan invited me to join their WhatsApp group on the topic of the forthcoming General Conference. I thought March was a busy month to be with many old friends but April was no different explained below. I was with 3 old friends for lunch in a popular local restaurant in Cheras and had to share a table with a Japanese couple. In March, I had an old friend Tony Seow from Utah visiting me and I introduced him to Michael Lee who was part of my history of serving as a missionary in Malaysia shared here. Since the topic of number 7 is mentioned here with a photo of an old friend Tony Seow above, I just thought I'd post this photo related to Tony who had returned from Australia last month and gave me a stack of 7 piles of AUD50s to change into ringgits for him! 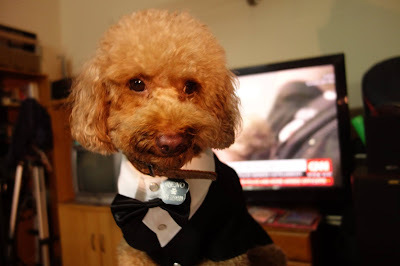 He can be seen in our family reunion video when we repeated our family cheer shared above. Patricia Cheah was our first miracle convert recorded here who is 90 years of age on this day and she was with her younger brother who is only 5 years younger seen sitting at the lunch table photo above arranged by Michael who picked them up by car to find me. Here is a quick story of another miracle that happened while I was in the car with them heading to the restaurant. 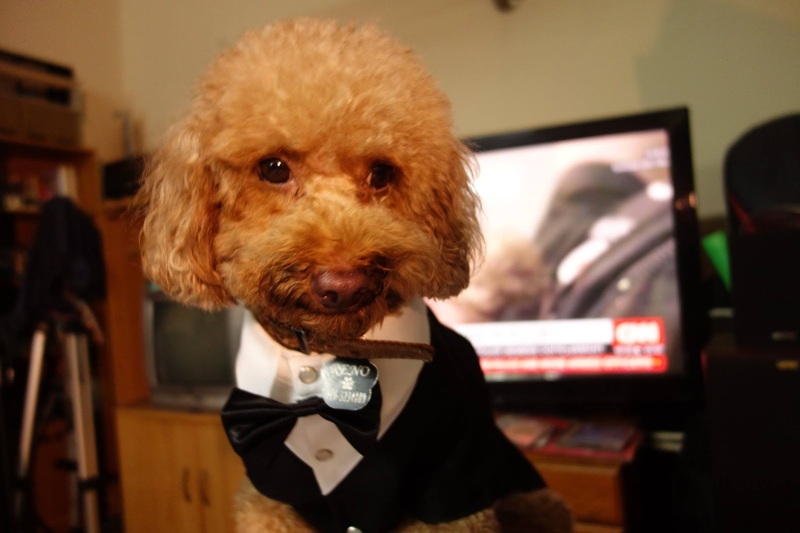 My phone suddenly rang and it was another friend who asked me, out of the blue, to help sell his luxurious apartment. Now I'm not a real estate agent and I guess he knew I was well connected so I responded that I will try to follow up for him. After lunch, outside the restaurant, while waiting for Michael to drive up the car close to the two elderly siblings, a man started staring at me and I looked at him to ask if he knew me. He said I looked familiar and mentioned our old school to even recollect my name but I couldn't remember him as in our brief dialogue, I discovered that we were never in the same class together. Furthermore, he didn't attend a reunion event that I had recently promoted and organized last December. He gave me his name card and he turned out to be a property agent! Synchronicity strikes again! A message came to me that I was too busy to realize or respond to when it came in at the start of the week when I was fully engrossed in the multiple activities of my "ShanFu-Consciousness." This included determining how I would end my book, cleaning house full of things stored and paperwork unfinished which if not completed my mind will be sub-optimal to create a best seller book! This is from Johnson who visited me at a timely moment in March. 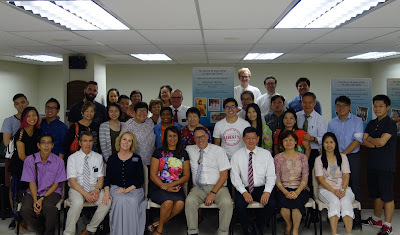 Being a member of the Church from India, meeting him caused my consciousness to pull out the book written by my mission president Talmage Jones in 1980-82 who pioneered setting up the Church in India as mission president of 5 countries that included Singapore, the mission headquarters and Malaysia, India, Sri Lanka, and Indonesia. 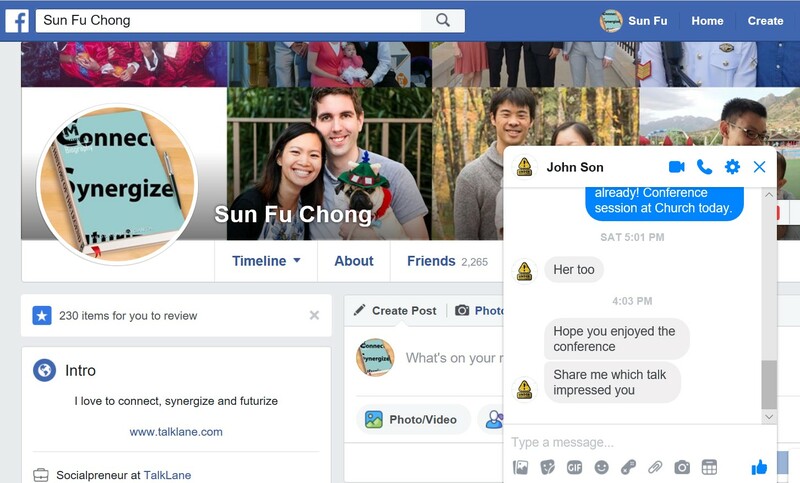 Johnson is also a skilled person in the field of computer programming to learn of my desire to publish my book online and offered his services to me. Am I not a lucky man? On the weekend following the conference, we had a replay of the entire recorded event where I made more notes while watching the videos that highlighted more personal notes to me than watching them live the first time. 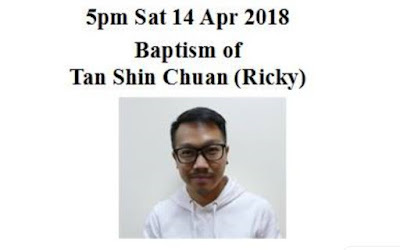 We had a linger longer lunch on Sunday where I met up with Ricky above to chat but was not aware then until I got his photo above of his baptism exactly a year ago on that Sunday to share here. 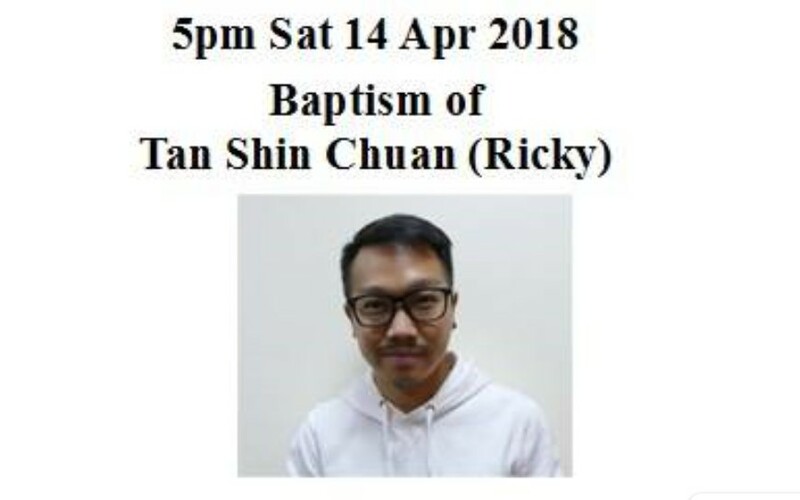 I was then the branch mission leader to conduct his baptism service and it was an unforgettable experience. The meeting was filled with a fulness of the Holy Ghost where tears were flowing in our eyes especially mine to hear his testimony shared to the members present! 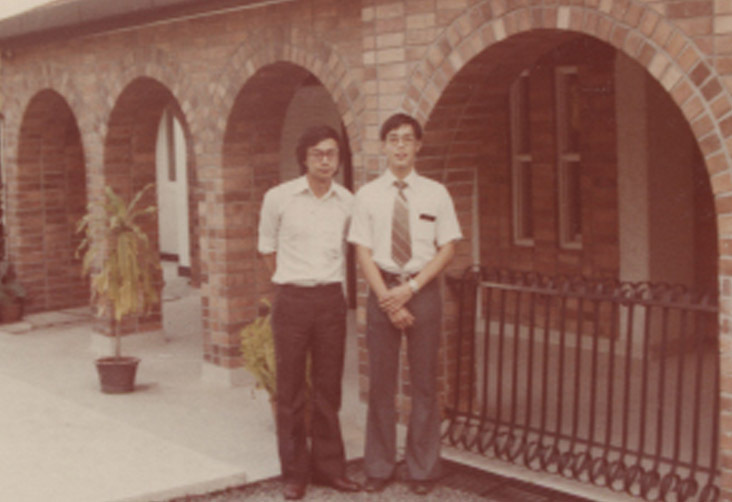 He became an awesome member helping to fellowship with new people learning the Gospel to eventually receive the Melchizedek priesthood and later called as the Elders Quorum president of the branch! This is marketing 101 that I somehow overlooked as I was more concerned to emphasize in the title that it was just "My consciousness" and not that of the general public. From all the research I've done and my life's accumulated experiences compared to others, I am unafraid to publish it as a genuine discovery of mine with my name on it as I really do feel I have broken the code so to speak of the enigma of our Human Consciousness. That Sunday, I gained more than just being at Church to watch a replay of the Conference. I am always grateful for my friends and family members who teach me and touch my life for good more than they realize! Thanks to Barbara Hong, a new found friend offline and online, who must have felt something thousands of miles away to send me a message on Facebook, that she rarely does, at the right timing again to affirm that yes, "Everything has come Together" for me. 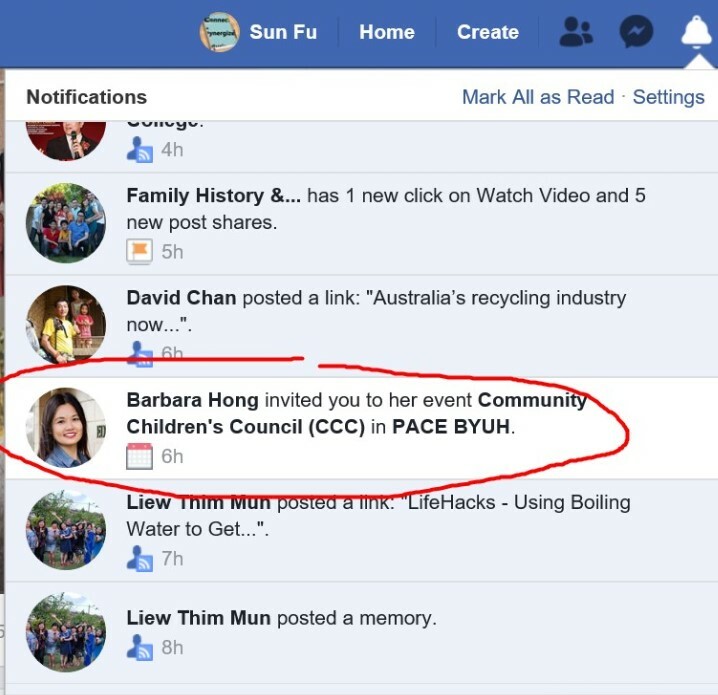 From Barbara's message, I somehow managed to get to see her latest online interview published on 9 April 2019! I have journalized in the past 40 years of my life, at this point of writing, to make it possible to publish a book today with up-to-date skills, knowledge, perception backed by extensive personal experiences which I feel is worth sharing especially to leaders and citizens of the superpower countries of America as No 1 and China as No 2, in our somewhat precarious world today. It is also for the rest of the world to see if my rationale shared will help readers predict the future of these two giants where if they sneeze, we will catch a cold! For personal benefit and families, my book should also be useful for helping readers optimize their lives wherever they live to ensure that they can be happy, healthy and productive in contributing to the world to make it a better place for everyone. My "ShanFu-Consciousness" view of the future will give readers the frame of the Body Mind & Spirit which they can apply to their own fields of interest and endeavors in order to profit from the future. I will help readers focus on the whole and don’t get lost in details or things that will only be blips on the screen of their phones about the world which has become famous in the US to be called "fake news."